Lightness, efficiency, durability and economic as well as ecological viability are key attributes required from materials today. In the transport industry, the performance needs are felt exceptionally strongly. 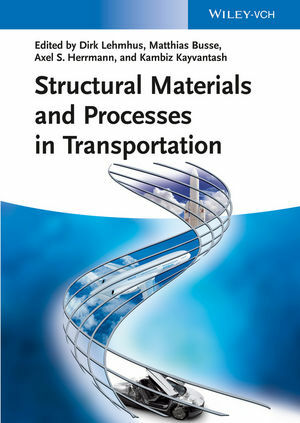 This handbook and ready reference covers the use of structural materials throughout this industry, particularly for the road, air and rail sectors. A strong focus is placed on the latest developments in materials engineering. The authors present new insights and trends, providing firsthand information from the perspective of universities, Fraunhofer and independent research institutes, aerospace and automotive companies and suppliers. Matthias Busse holds the chair for near net shape manufacturing technology at the University of Bremen, Germany, at the faculty of production engineering. In 2003 he became director of the Fraunhofer Institute for Manufacturing Technology and Applied Materials Research (Fraunhofer IFAM). After his PhD he started his career at Volkswagen where he was promoted to head of production research in 2001. He represents the University of Bremen's newly founded Scientific Centre ISIS as speaker of the board of directors. Axel S. Herrmann has taken over the post of director at the Faserinstitut Bremen (FIBRE) e.V. in 2001. After his PhD he became head of the composite structures demonstration centre at DFVLR (now DLR) and was was responsible for the affiliated department of fibre-reinforced composite technologies until he moved to Bremen. Axel S. Hermann has taken a leading role in establishing the CFK Valley Network of Excellence in Stade, Germany. In addition he is general manager of the Composite Technology Centre (CTC) GmbH Stade. Kambiz Kayvantash holds the Chair for Automotive Technology at Cranfield University, UK, and is currently Head of the Centre for Automotive Technology and Director of the Cranfield Impact Centre that contributes to the aeronautic and motor sport industry. He has more than 25 years professional and consulting experience in automotive safety, materials modeling and software applications. Kambiz Kayvantash is the Chairman of the Simbio-M conference, dedicated to biomechanics, biomaterial, biomedicine and biomolecular research. Dirk Lehmhus received his mechanical engineering diploma based on studies dedicated to galvanic corrosion of magnesium alloys at Volkswagen's central laboratory. He joined Fraunhofer IFAM in 1998 and obtained a PhD in production technology at the University of Bremen for studies on optimization of aluminium foam production processes and properties. In May 2009, he changed to the University of Bremen as managing director of the ISIS dedicated to the development of sensor materials and sensor-equipped structures.